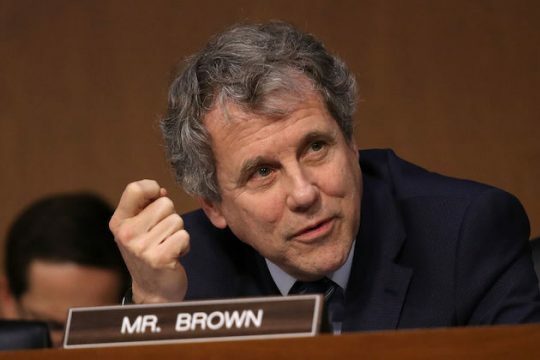 Ohio Senator Sherrod Brown's campaign hasn't yet committed to a debate focused exclusively on the 2017 tax cuts enacted by the GOP and President Trump, despite telling the New York Times he would be willing to devote an entire debate to the issue. Just over one month ago, Brown (D.), was quoted by the New York Times as having said Republicans "should be ashamed of their tax bill, and I think they are." The paper added, "Mr. Brown said he would be willing to devote an entire debate with Mr. Renacci just to the tax law: ‘I think this is a fundamental difference between the two parties.'" Now, Republican challenger Rep. James B. Renacci's campaign is trying to hold Brown to his offer. Columbus Dispatch reporter Randy Ludlow tweeted on Saturday, " . @SherrodBrown campaign announces @JimRenacci campaign has agreed to three U.S. Senate debates in Columbus, Cleveland and Cincinnati." Leslie Shedd, senior communications director for Renacci disputed some of that in a response, while pressing the tax cuts issue. "Just to clarify, we have agreed to AT LEAST three debates but no locations have been confirmed," Shedd tweeted. "We’d love to have more than three debates. @SherrodBrown told @jimtankersley he wanted at least one debate on taxes – and we have publicly accepted that." Just to clarify, we have agreed to AT LEAST three debates but no locations have been confirmed. We’d love to have more than three debates. @SherrodBrown told @jimtankersley he wanted at least one debate on taxes – and we have publicly accepted that. Brown is one of this year's so-called "Red State Democrats"—a Democratic senator up for reelection in a state President Trump won in 2016. The president, and Republicans in general, has been quick to champion last week's news of GDP growth of 4.1 percent as proof of the tax cut's potency in stimulating economic growth. Renacci has served since 2011 in Ohio's 11th Congressional District, which encompasses some of the areas near Akron and some Cleveland suburbs. The Brown campaign was not immediately available for comment. This entry was posted in Politics and tagged 2018 Election, Sherrod Brown, Tax Reform. Bookmark the permalink.